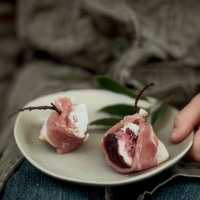 Wrapped up in Parma ham, these exotic, fleshy purple figs make a perfect autumn starter. Cut the stalks off each of the figs and cut them into quarters. Top the cut side of each fig with a teaspoon of the cheese. Wrap with a slice of the Parma ham. Then spear each fig with a cocktail stick to secure and place on a large serving plate. Drizzle the plate with the balsamic glaze, if using, and serve, napkins to hand. These are also delicious served warm. Heat a frying pan and fry the wrapped figs for 3-4 minutes, turning halfway through, until the ham is crisp and the cheese is warm and melting.